Though Vancouver is not mentioned, our transit fares are right there up with the big boys, with three fare zones, starting at $2.75 for one zone and $5.00 for traveling three zones; how soon will our one zone fare match that of Toronto’s and a three zone fare match that of London’s Underground? Note: All prices have been converted to Canadian dollars based on the exchange rate on Nov. 23, 2009. London’s Tube, the world’s oldest underground transit system, can also boast being the most expensive. While savvy riders will use an Oyster card to drop the single ride price to about $3.86, the average commuter would be forced to pay nearly twice that for a regular ticket during rush hour. The London Underground is connected to all of the city’s suburbs (and even, via the Eurostar railway, to Paris), but the extra distance will just cost extra. The initial $7 fare covers only one-way travel within the city’s core. The Berlin U-Bahn operates on the most extensive underground transit system in Germany. Yet to see the entire capital, don’t expect the above fare to cover it all. A one-way pass to roam the whole town would cost more than a dollar extra ($3.32 only buys you access to Berlin’s core trains). If you want to bring your bike, not only does the U-Bahn charge up to an additional $3.16, but there is another fee for commuters wanting to bring large dogs onboard. Fares are so high on the D.C. Metrorail because it’s one of the few North American transit systems with no dedicated source of government funding. In fact, almost 60 per cent of the Metrorail’s operating budget has to come from fare revenue alone, so you can see why the price of a fare has gone through the roof. The good news with riding the D.C. Metro: Washington is said to have some of the most congested car traffic in the U.S. The bad news: a one-way ticket, if your commute is over a certain length, can easily jump to as much as $4.75. Like many subway systems around the world, it’s much cheaper to ride the Oslo T-Bane if you buy your ticket in advance. But even with those savings (advance fares are still $4.16), this Norwegian transit system is one of only two in the world to routinely cost more than four dollars per ride. Make sure you get your pass stamped before you board a train in Oslo, too. Neglecting to do this could get you slapped with a $140 fine. Stockholm’s Tunnelbana boasts 100 well-decorated stations, leading to the transit system being known as the “longest art gallery in the world.” And creativity in design isn’t the only reason the Swedes are on the cutting edge. Riders of the Tunnelbana are some of the first in the world to be able to buy a metro ticket via text message. Commuters might be better served visiting an operator instead, though, as a text message pass costs at least $1.53 more than a regular ticket. Who knew that the tiny TTC, with only 69 stations in a city of 2.5 million, could rank so high on the world list of most expensive transit systems? Public outcry against the TTC has brewed for years, yet the commission’s decision to increase fares from $2.75 seems to finally have people bubbling over. While the system is expanding across Toronto, recent media reports suggest the city’s proposed 2010 budget would allocate a whopping 59 per cent of taxpayer dollars towards building — not operating — the TTC. Factor in the cost to run Canada’s most controversial transit system, and another fare hike isn’t hard to see down the road. The most modest entry on this list, Sydney’s transit system is also the only one without a subway line. But while the city’s Metro Light Rail covers just 14 stops, don’t let its smaller infrastructure fool you. Sydney’s expansive bus system will cost you over the three dollar mark and — with a proposed subway system slated for a 2014 opening — perhaps soon will increase. Commuters in Brussels can save a bit of money ($0.47) by paying in advance, but the average rider who buys a ticket onboard the city’s metro is in for a hit on the wallet. The Belgium capital is home to some transit innovation: A demonstration of the city’s streetcars, for example, will run on a 1.8 km track in Vancouver at the 2010 Olympic games. Yet few accolades can ease the sting of a fare on the Brussels Metro, the third most expensive subway system in all of Europe. A Flash From the Past – “Skytrain gathers speed despite cost to taxpayers” – From Charlie Smith & The Georgia Straight. In light of TransLink’s newly departed CEO, Tom Prendergast’s parting shot at the SkyTrain Lobby, “It’s overcoming the cultural embracement of SkyTrain that has existed to date.” …… “TransLink is seeking to cut through the pro-SkyTrain “cultural bias”…………….”, which is entrenched in all levels of civic and provincial bureaucracy; we should look at the warnings given almost a decade ago about the pitfalls with SkyTrain and light-metro. Charlie Smith has been and is the most knowledgeable reporter on regional transit issues and his relentless investigative reporting on SkyTrain has shed much light on the troubled light-metro. Certainly this article sheds some light on how our regional transit planning has been skewed to favor only a SkyTrain solution. Though a truncated, generic heavy-rail metro was built instead of SkyTrain, it is interesting to have a look back and see how accurate Charlie Smith was about SkyTrain and the RAV/Canada & Evergreen Lines and the financial mess that TransLink is in today. For more than two years, Lower Mainland critics of SkyTrain have waged a noisy and so far futile battle against expansion of the rapid-transit system. Four NDP cabinet ministers who have overseen the project-Joy MacPhail, Jenny Kwan, Graeme Bowbrick, and Mike Farnworth-have casually dismissed any arguments about the prohibitive cost of building SkyTrain. Critics such as environmentalist Deming Smith, light-rail advocate Malcolm Johnston, transit consultant Ron Stromberg, UBC academic Peter Boothroyd, and neighbourhood activist Phil LeGood have also failed to persuade civic politicians on the boards of TransLink and the Greater Vancouver Regional District that extending SkyTrain will do nothing for traffic congestion and air pollution. Even if SkyTrain is built to Coquitlam and to the corner of Granville Street and Broadway, there will be just 17,000 people on the system during the peak morning rush hour, according to the provincial Rapid Transit Project Office. That will leave almost half a million others relying on private vehicles and other forms of transit to get to work or school. Meanwhile, B.C. Auditor General Wayne Strelioff has repeatedly refused requests from antitax crusader Liz James and environmental activist Dave Norman to audit the project, even though the Millennium Line is “potentially four months over schedule”, according to a capital-spending review last year by Deloitte Consulting. At this point, the SkyTrain appears to be unstoppable, driven by powerful forces prepared to flatten any obstacle in its way. Frequently, the critics are dismissed with lectures about the importance of the GVRD’s Livable Region Strategic Plan (Stromberg prefers the term “Gullible Region Strategic Plan”), which can only succeed with a rapid-transit project linking major municipalities. Because provincial and local politicians don’t want to risk the wrath of merchants and drivers who might oppose a street-level light-rail line taking up two lanes of the street, the public is told that a rapid-transit line must be separated from the roadway. More buses are seen as impractical because they don’t “shape development”. Hence, we get more SkyTrain, at great benefit to the contractors, engineering firms, real-estate developers, and shareholders in Bombardier Inc. To its growing legion of critics, SkyTrain is a disaster for neighbourhoods, taxpayers, and the vast majority of transit riders. The Millennium Line-linking New Westminster’s Columbia Station with Lougheed Mall and Vancouver Community College’s King Edward campus-is meeting its $1.2-billion budget, the provincial RTPO insists, even though the guideway contractor has put in a claim for at least $35 million in added costs. The cost of another line linking Lougheed Mall with Coquitlam Centre has been estimated at $730 million, with $650 million expected to come from TransLink. Vancouver city hall has estimated the cost of a mostly underground extension from the King Edward campus along the Broadway corridor to Granville at $527 million, though that figure has not been confirmed by the Rapid Transit Project Office and has been ridiculed by SkyTrain critics as too low. TransLink is reviewing another possible extension linking the airport to Broadway in time for the 2010 Olympic Games, if Vancouver’s bid succeeds; so far, there is no cost estimate and no preferred route. Stromberg has concluded that a $2.5-billion capital project financed over 30 years at a seven-percent interest rate would result in an additional $3.5 billion in interest payments. Greer’s report pointed out that the cost of a light-rail maintenance yard was tripled from a 1994-95 estimate to $110 million. The RTPO also used “higher end” prices for light-rail transit cars, Greer claimed, then concluded that SkyTrain cars could be bought at a discount. Perhaps most troubling, Greer wrote that the company that evaluated the cost of SkyTrain, SNC-Lavalin, had a “direct interest” because it is the preferred engineering firm for SkyTrain systems, which are sold exclusively by Bombardier. “The Lavalin assessment therefore, could best be viewed as a bid of a proponent, competitively crafted to minimize the apparent costs of the project,” Greer wrote. Campbell compared the SkyTrain extension project to the “fast-ferry fiasco”. However, if history offers any lessons, Campbell’s bombshell and the accompanying two days of media coverage may not be enough to stop the planned extensions. After all, many of Greer’s criticisms had already been pointed out by UBC’s Boothroyd and his then-graduate student, Tamim Raad, in a detailed 1999 comparison between light-rail and SkyTrain. They concluded that the cost differential between light rail and SkyTrain was either 34 percent, 70 percent, or 133 percent, depending on the assumptions, which meant that the province could have saved between $700 million and $1.6 billion by going with street-level light rail. RTPO had put the cost differential at eight percent. In 1998, light-rail advocate Louis Guilbault pointed out that the Calgary light-rail project would have cost $28.8 million per kilometre in 1998 dollars, whereas the RTPO’s consultant, Parsons Brinckerhoff, had claimed that it was $41.1 million. Stromberg demonstrated that a new 10-kilometre SkyTrain line at the JFK Airport in New York City cost $93-million per kilometre, whereas SNC-Lavalin had estimated the cost of SkyTrain to be around $55.5 million per kilometre in the Lower Mainland. In 1998, the Light Rail for Vancouver Committee had claimed that the latest order of SkyTrain cars from Bombardier cost the equivalent of $42,000 per passenger space, compared to $20,000 per passenger space for light-rail cars in Denver, $24,000 per passenger space for light-rail cars in Dallas, and $26,000 per passenger space for light-rail cars in Portland. The same year, the minister responsible for SkyTrain, Joy MacPhail, admitted in the legislature that the government had not calculated the cost-recovery on more SkyTrain lines. Cost-recovery is a critical factor in transportation planning, because whatever cannot be collected from users must be covered through government subsidies. Before TransLink was created, SkyTrain consumed 35 percent of BC Transit’s operating and debt-servicing costs while carrying just 15 percent of the passengers, according to then-manager of strategic planning Glen Leicester. The original SkyTrain from Waterfront Centre to King George Station in Surrey, including the rolling stock, cost $1.23 billion, not including debt-servicing costs. According to a 1998 GVRD consultant’s report, the SkyTrain debt-servicing costs alone for 1997-98 were $143.3 million. So how could a service that costs so much money and carries so few passengers continue to be extended across the region? Former Socred premier Bill Vander Zalm wanted to build a SkyTrain extension from Richmond to Vancouver via Cambie Street but ran into intense opposition from Campbell, then the mayor of Vancouver. On November 15, 1991, the BC Transit board approved the purchase of 60 of the larger Mark II SkyTrain cars after a presentation by BC Transit official Clive Rock, who is now a senior bureaucrat at TransLink. In Opposition, various NDP politicians decried the system, and they stopped the order for 60 SkyTrain cars from going through after assuming power in 1991. 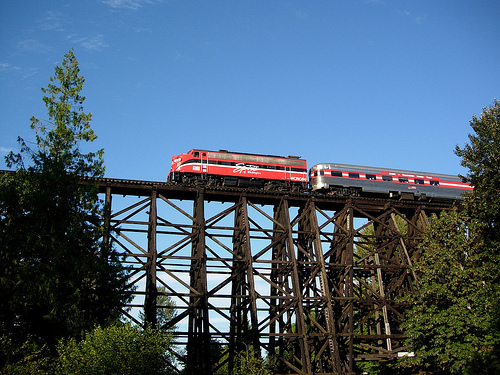 Glen Clark said in the legislature in 1994 that it was a “really dumb decision” to build the original SkyTrain, referring to it as a “toy train”. But pressure was building in a different direction. The wily premier of Quebec, Robert Bourassa, persuaded Premier Mike Harcourt in 1993 that BC Transit could benefit by helping Bombardier and SNC-Lavalin market the SkyTrain in Asia. In 1995, former BC Transit chairman Eric Denhoff told the Georgia Straight that he had argued vehemently in favour of adding up to 50 new large SkyTrain cars before the Crown corporations secretariat reduced the order. Denhoff and BC Transit vice-president Bob Tribe eventually negotiated a smaller, 20-car purchase from Bombardier, and were later hired by SNC-Lavalin. As chairman of SNC-Lavalin’s B.C. development board, Denhoff persuaded the provincial government to sign a deal in 1995 to help market the SkyTrain abroad, bringing Bourassa’s vision to fruition. Under the agreement, SNC-Lavalin would retain B.C.-based engineering firms to complete at least 25 percent of all detailed engineering work. Perhaps most significantly, the deal granted SNC-Lavalin at least 25 percent of the outsourced project management and engineering work if BC Transit decided to extend the SkyTrain in the Lower Mainland. This put the provincial government in an awkward position. It could reap financial rewards if SkyTrain was built in Asian cities, but it would be a difficult sale if a different form of rapid transit was chosen for the Lower Mainland. A month earlier, the provincial government had issued a report suggesting that light rail made the most sense in attracting development and containing costs. For the GVRD, light rail was a cornerstone for meeting the objectives of the Livable Region Strategic Plan. Campbell, as the former chairman of the GVRD, played a key role in developing the plan, which described how population increases could be accommodated across the region while preserving greenspace and agricultural land. Developed at a time of extremely high interprovincial and international immigration, the plan called for big population increases in Coquitlam and Port Moody. Conveniently for Campbell, it allowed much of Vancouver to remain zoned single-family. After former premier Harcourt and Clark together announced the light-rail projects in September 1995, a GVRD staff report went to the board saying that BC Transit didn’t have the expertise to build light rail. Instead of hiring someone with light-rail experience to oversee the project, then-premier Glen Clark chose Lecia Stewart, a former journalist who had developed the West Coast Express commuter-rail line. Commuter rail was relatively simple compared with the plan to build street-level light-rail across the region. Vancouver Coun. George Puil, quickly becoming the most powerful civic politician in the region, publicly doubted the wisdom of a light-rail line on Broadway because he said it would tie up traffic and eliminate streetside parking. As a result of municipal concerns, Stewart’s office decided it would be necessary to keep the train off the street in many areas, boosting the cost. According to Greer’s report, Stewart’s office was already studying the possibility of building SkyTrain in 1997, even though it had been rejected by Clark and Harcourt. In June, 1998, Clark shocked GVRD politicians by announcing that SkyTrain would be built instead of light-rail. 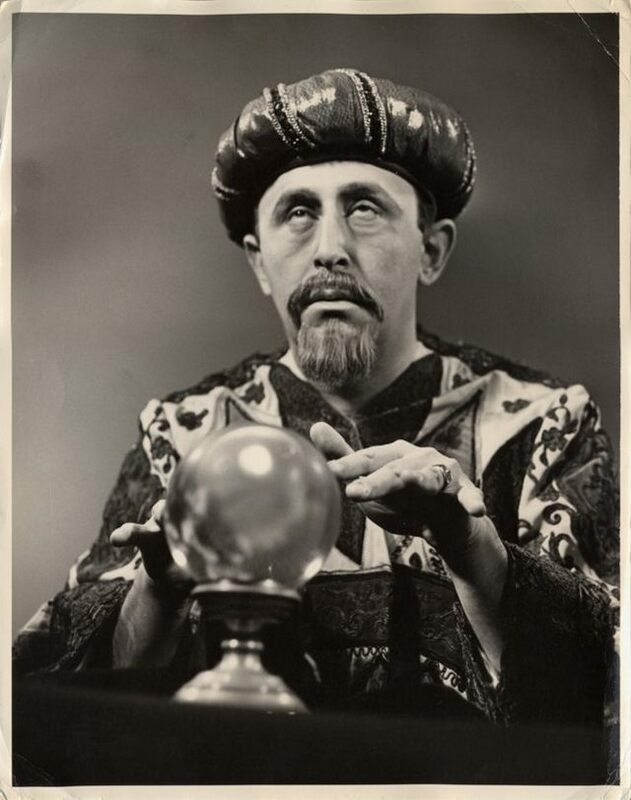 To reinforce the wisdom of the decision, RTPO hired a construction-cost expert, Tony Steadman, to perform due diligence on the cost estimates for SkyTrain and light rail before they were examined by SNC-Lavalin and Parsons Brinckerhoff. Campbell has a choice. He could attend the TransLink annual budget meeting on February 16 and tell the directors that he opposes the $650-million investment in the Coquitlam SkyTrain extension. For good measure, he might add that building SkyTrain along Broadway is also a silly investment if the objective is to alleviate traffic congestion. Or he could continue supporting his Livable Region Strategic Plan. Because the way things have developed, it’s going to be difficult to do both. 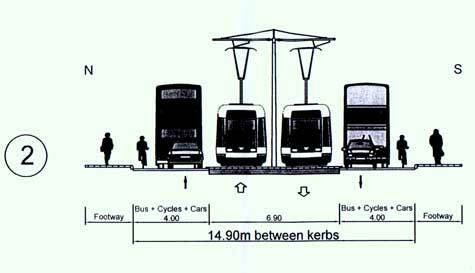 On-street Light Rail – Streetcars & Trams – How would it look? 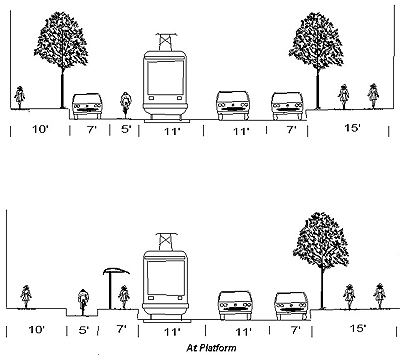 The following are streetscapes and street cross sections of modern LRT (streetcars or trams) operating on-street and will help many to visualize how a modern tram would look on a typical city street in Vancouver, Langley, Abbotsford and even Chilliwack. The above picture shows a pure streetcar setting with cars and trams sharing a common road. 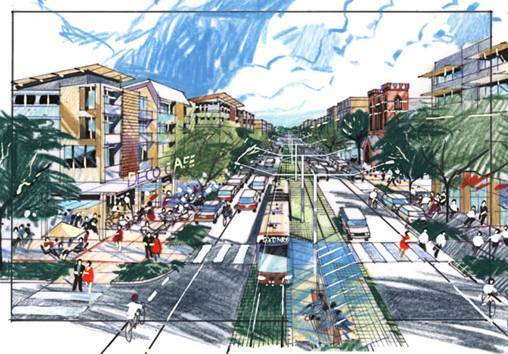 Simplicity and affordability are the keynotes in this type of light rail planning. Streetcars suffer from being stuck in auto traffic flows which reduce commercial speeds but still a tram operating on-street is about 10% faster than a bus using the same route. 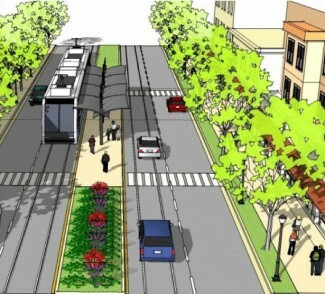 The above two pictures shows the next step forward, a tram operating on a reserved rights-of-way on a one-way street. Operating on a reserved rights-of-way means that the tram is now light rail and can achieve faster speeds between stations increasing commercial speeds as there is no auto impediment. Also, when a tram stops at a station, it does not impede motor traffic. The tram route offers one tram line, to lanes for vehicular traffic, a parking lane, a bicycle lane and two spacious sidewalks for pedestrians. The above picture illustrates a streetcar or tram, operating as light rail on a reserved rights-of-way on a narrow city street. Auto capacity is restricted but the capacity of the two tram lines have the potential to exceed 20,000 persons per hour per direction, far greater than the ,1600 to 2,000 pphpd capable on the two auto lanes. By installing a tram or light rail on a city street, has increased the potential capacity of the auto lane by over 18,000 pphpd! Contrary to the doom and gloom of the SkyTrain lobby, this is how Broadway could look with modern light rail, a vibrant pedestrian friendly, cycle friendly and merchant friendly street; a place where locals, out of towner’s and tourist will want to frequent. The following letter to the Surrey Leader certainly shreds the SkyTrain Urban Myth that it is faster and has more capacity than light rail. What the SkyTrain lobby and mainstream media forget, that both modes are railways (SkyTrain is an unconventional railway) and adhere to the same operating principals. SkyTrain’s reputation has been created by BC Transit and TransLink, yet outside the lower mainland, SkyTrain continues to be rejected by transit planners and only can be sold in private deals that are largely funded by the Canadian government! There are only seven SkyTrain type systems in operation, despite being on the market for over 30 years. There is no evidence that the SkyTrain light metro or any light metro for that matter is faster or has a greater capacity than LRT and is the prime reason why light rail made light metro obsolete almost two decades ago. The article “TransLink’s Prendergast offers parting advice” contains an error, which is commonly made by those who know little about modern LRT, which must be rectified. The comment: “At-grade light rail typically can’t carry as many people or run as fast as grade-separated SkyTrain,” is absolutely false. The maximum capacity of a modern LRT line is over 20,000 persons per hour per direction and even some European streetcar or tram systems do manage 20,000 persons per hour in peak hours on portions of their lines. SkyTrain, limited by automatic (driverless) train control can only manage under 15,000 persons per hour and needs a billion dollars or more in upgrades just to match what modern LRT can achieve today. As for speed, SkyTrain’s higher commercial speeds can be, in part, accounted for fewer stations per route kilometre than comparable LRT systems. The maximum speed for SkyTrain is about 80 km/h, yet in Portland, their MAX LRT line travels at 90 km/h on portions of their line. MAX’s commercial speed is lower than SkyTrain because it has about twice as many stations per route kilometre than SkyTrain and the light rail travels as a streetcar through downtown Portland, with no track reservation or signal priority at intersections. St. Louis’ LRT system in fact has a higher commercial speed than our SkyTrain light metro. 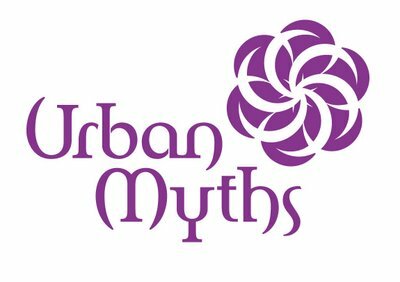 One would wish the media stop listening to the many SkyTrain urban myths and start dealing with established facts about modern light rail. Here we go again department. The hoary old turnstile debate is again before us and leading the charge is Richmond council, wonderful. The current council in Richmond know little, if anything, about transit and I would suspect that the ‘turnstile issue’ is nothing but a propaganda ploy to hide the real problems with our light-metro system. I wonder if politicos in Richmond truly understand the costs involved with an automatic light metro, let alone understand the nuances of fare evasion and turnstiles. 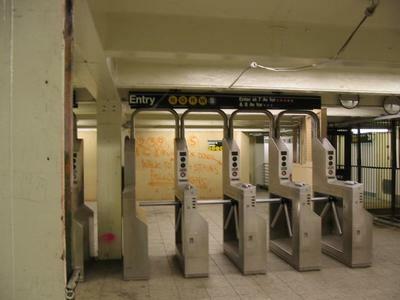 The basic question for turnstiles is this: a) The annual cost of fare evasion on a transit line; b) The annual cost of operating a turnstile/fare-gate system; and subtract (a-b) and if the answer (c) is in negative territory, it is not cost effective to install turnstiles. Everyone wants a scapegoat to point fingers at for TransLink’s current financial woes, while at the same time ignoring the real reason: TransLink operates three metro lines on routes that do not have the ridership to sustain them, the resulting money to subsidize the metro is taken from the buses. Simple; Prendergast knew that and it is part of the reason why he left, as there was no future for TransLink until senior governments admitted that because they forced much more expensive light-metro on the region, they must ante up more subsidies to support the expensive transit mode. Adding turnstiles (which are somewhat ineffective in preventing fare evasion) will only add to the financial burden of SkyTrain. TransLink should scrap its planned fare hikes until it does something about the cheats ripping off the system for millions of dollars, say two Richmond councillors. A recent TransLink report estimates total fares evaded across the system between $5.3 million and $9.5 million annually. The regional transportation body wants a 10-per-cent fare increase next year and a three-cent-per-litre hike to the gas tax as well. “I won’t say it’s out of hand, but it’s getting to that point. It’s a significant amount of money. It also sets a tone,” said McNulty. SkyTrain user Marcel Potter said he is “sick and tired” of politicians “bellyaching” about a lack of funds. Violators don’t even pay when they’re caught. Last week, The Province revealed that transit cops checked 374,000 people and handed out 11,500 tickets for fare evasion worth $173 each this year. Through the end of June, just 1,423 of 9,909 tickets were paid — leaving almost $1.2 million in outstanding fines. TransLink spokesman Ken Hardie said fare gates have never been profit-making ventures in the past. 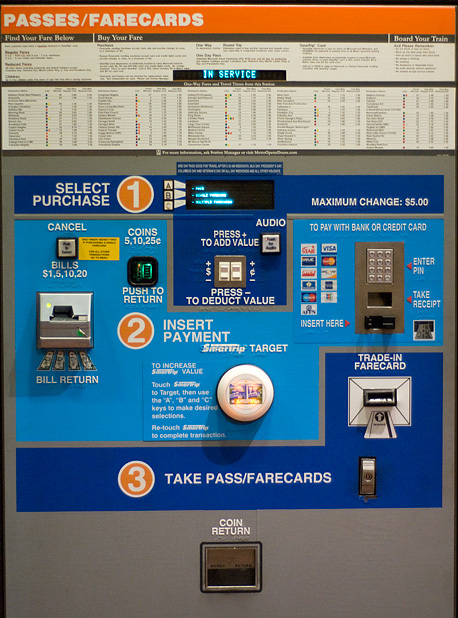 “There is no economic argument to go with fare gates. They cost more than you can ever get back,” he said. What’s more, Hardie said, money collected from fare evasions could never offset the $130-million shortfall TransLink faces next year. He said the Richmond councillors’ argument “sounds fetching, but it’s a suggestion which will not work. We need more money to sustain the system than we could ever hope to gain by fare evasion,” he said. Meanwhile, the whole question of turnstiles will soon be turned on its head with the aid of senior governments and a smart-card system that Hardie said will finally make turnstiles economically viable. B.C. Transportation Minister Shirley Bond said that turnstiles are on the way in Metro Vancouver, perhaps as early as next summer. The province has put up $40 million, the feds $30 million and TransLink will put up $30 million to install turnstiles and a smart-card system. Retrofitting Expo line stations to accommodate turnstiles will cost even more money, but the brand new Canada Line was designed with turnstiles in mind. A couple weeks ago, it was announced that Translink CEO Tom Prendergast was quitting his position, and accepting a job as president of New York City’s Transit Authority. He had only joined Translink in July 2008, and now he has left! I am guessing he didn’t like what he saw. Prendergast was as positive a force as could be expected in such an organization as Translink, run under the tightest of control of Premier Gordon Campbell. Kwantlen Student Association rep Nathan Griffiths said improved transit is needed to serve campuses in Cloverdale and Langley and asked about the potential to extend passenger light rail to the Fraser Valley. He said TransLink is seeking to cut through the pro-SkyTrain “cultural bias” as it embarks on a careful examination of rapid transit technologies for line extensions west along Broadway and south of the Fraser. It’s interesting to think about this “cultural bias” towards Skytrain. Who actually has this bias? It isn’t residents or even politicians in the Fraser Valley: Not a single municipal candidate in Surrey the last election supported Skytrain expansion over light rail. Not a single candidate. Not one! No, it’s the old-guard politicians of Vancouver, who were around for the previous Skytrain expansions and have the most personal stake in continuing to expand the Skytrain money hole. It’s Mike Harcourt, it’s Gordon Campbell, and others involved in Vancouver’s transportation decisions of the last 25 years. To anyone who wonders why the problems with Skytrain often take centre stage on this blog, Prendergast answers the question. 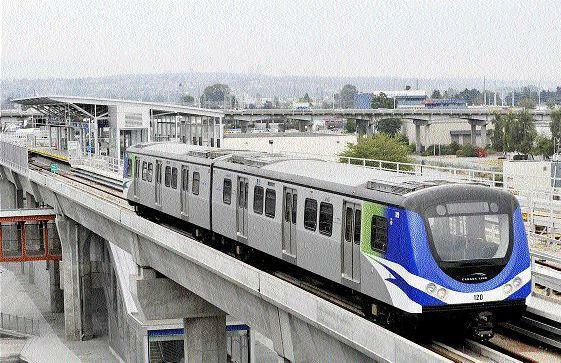 To get light rail for the valley, we absolutely must cut through the pro-SkyTrain “cultural bias” that exists, not among the populace of the Fraser Valley, but among Vancouver’s political elite, who all-too-often take it upon themselves to make all the decisions for the rest of us. It’s that time again, membership renewal requests are in the mail or in one’s email box. Zwei is renewing his annual subscription to the Light Rail Transit Association and would like you to consider joining the Light Rail Transit Association. 1) The LRTA membership includes an annual subscription to the excellent Tramway’s & Urban Transit. 2) The LRTA blog, which is open to members only, is an excellent source of information on transit around the world. 3) With a larger membership in our area, we could get an article published on our efforts with Rail for the Valley for world wide coverage. To succeed, Rail for the Valley must be well informed and there is no better way of being well informed than joining the Light Rail Transit Association. There is a growing number of people in the region who believe that buying and operating more buses will solve our local transit woes, yet the same people refuse to recognize the buses just do not attract much new ridership. 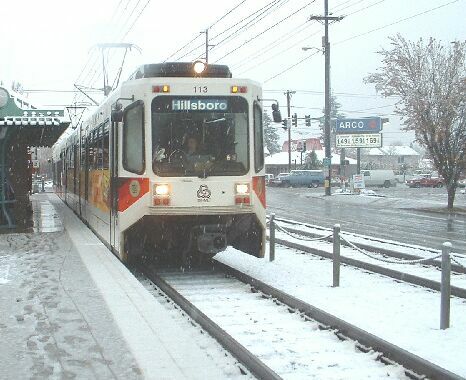 Mr. Fox’s article mat shed some light on the bus/LRT issue and why Portland opted for light rail. This transit story from the Seattle Times illustrates the land value for a soon to be abandoned rail lines, which with the current railway land deal, amounts to slightly over $1 million a mile or about $0.6 million/km. A local example would be the Arbutus Corridor, which using the same formula as used in Seattle, would cost about $6 million to buy. Where Seattle’s government organizations are showing foresight in buying and protecting redundant and/or abandoned railway lines for future use, METRO Vancouver buries it’s collective heads in the sand, ignoring what must be done and continue to support hugely expensive metro projects that have done little to reduce auto congestion or pollution, while at the same time, proposing ever higher taxes and user fees to fund the nonsense. Future generations will condemn the present METRO Vancouver Board for their short sightedness and incompetence. King County Executive Kurt Triplett proposed today that the county spend up to $26 million to buy most of the southern part of BNSF Railway’s 42-mile Eastside rail corridor for future use. King County Executive Kurt Triplett proposed today that the county spend up to $26 million to buy most of the southern part of BNSF Railway’s 42-mile Eastside rail corridor. If approved by the Metropolitan King County Council, the purchase would help preserve for future rail and trail use the old rail line that connects Renton, Bellevue, Kirkland, Woodinville, Redmond and Snohomish. Under deals that are still begin negotiated, the Port of Seattle would buy the entire rail line from BNSF by Dec. 15 for $107 million or less, then would sell much of the southern part to King County and other partners. The county would own most of the 25 miles of the southern portion, but Sound Transit and Redmond are negotiating to buy smaller stretches from the Port of Seattle. Sound Transit could acquire a portion of the corridor in Bellevue for its planned Seattle-to-Bellevue-to-Redmond light rail line. Redmond could buy part of the Woodinville-to-Redmond spur, and Puget Sound Energy and the Cascade Water Alliance are expected to buy utility rights of way. King County would finance its part of the deal by selling bonds to be repaid with future revenues from the conservation futures property tax. That tax can only be used for acquisition of trails and open space — and legally can’t be used to rescue the county’s troubled general fund — Triplett said. He was joined in the news conference by County Council members Dow Constantine, Jane Hague, Julia Patterson and Larry Phillips, Lavender and Cascade Bicycle Club Executive Director Chuck Ayres. “Woohoo! I’m so excited,” Hague exclaimed. The Port will buy and hold the rail line between Woodinville and Snohomish, allowing a contractor to take over BNSF’s freight-hauling business. A trail could eventually be put alongside the track. From Woodinville to the south, where BNSF has abandoned the rail line, the future owners expect to eventually build a trail and passenger rail service. From the Vancouver Sun – Canada Line delivers 15,000 extra visitors a week to River Rock casino. Are gamblers the only new ridership? There is utter pathos in this news item as it seems to be the only news worthy story the mainstream media can say about the RAV/Canada Line, that it’s delivering 15,000 gambling addicted people, by metro, to the River Rock Casino each week. Did we spend a nearly $3 billion metro just to deliver more people to a casino? The RAV/Canada line was supposed to take 200,000 car trips a day off local roads and instead of attracting the all important motorist from the car (the commuter), the metro is giving gamblers a faster trip to lose their money. There has been absolutely no hint that the RAV/Canada Line has achieved any degree of modal shift from car to transit, as claimed ridership only shows that previous bus passengers are still using the new metro service and this news item continues the shameful way the mainstream media reports local transit news. METRO VANCOUVER — The River Rock Casino Resort is making it much easier for gamblers to spend their money. As part of a $30-million renovation, gamblers and other visitors can now get off at the Canada Line’s Bridgeport Station and walk directly to the casino via a new covered walkway (called the Starwalk) to the resort’s third floor. The Starwalk is also linked to the adjoining parkade and bus loop. Once in the resort, customers hop on a first-of-its-kind-in-Canada spiral escalator that drops them on the doorstep of dozens of slot machines and gaming tables. It appears to be a smart business move, with up to 15,000 extra customers heading to the casino each week following the opening of the Canada Line in August. “We’ve seen a 15-per-cent increase in guests since [the Canada Line] opened,” Howard Blank, River Rock’s vice-president of media, entertainment and responsible gaming, said in an interview Thursday. “And we think this will grow with this renovation. There’s a lot of older folks from Oakridge, Kerrisdale and Yaletown who didn’t want to drive here. And there’s also a lot of the [younger] hip crowd coming here [via the Canada Line] so they can drink and not have to drive. The 18-month renovation included not only the Starwalk — which incorporates an autowalk (a flat, moving escalator) and voice recordings from stars who have played there — but four private VIP suites (each holding up to 20 guests, with one dedicated to Vancouver musician Dal Richards) at the River Rock Show Theatre. There are also restaurant upgrades and a new lounge. A tour of the facility by The Vancouver Sun Thursday featured two escalators which, unlike traditional escalators, traverse two floors in a 180-degree circular span — a major change from the stairs that preceded them — and required seven months to assemble, install and test. The spirals were delivered from Japan in seven separate truss sections and installed by Mitsubishi. As well, the expansion includes a number of retail areas and community and transit policing offices. Also recently opened was a 1,512-vehicle parkade, a joint venture between the Canada Line and River Rock. Meanwhile, Blank said that so far there haven’t been any problems at River Rock related to petty criminals or drug dealers who often utilize a rapid transit line to commit crimes.